Dealing with self-doubt is something that even the most confident and comfortable people have to endure something. Whether you deal with self-doubt on a larger scale, or just occasional negative emotions, there are ways to try and move through this. 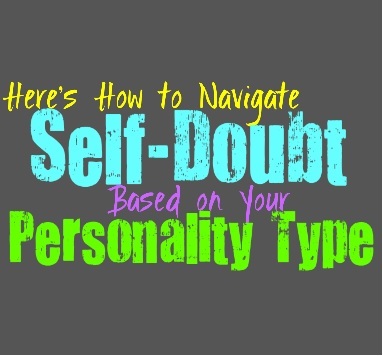 Here is how you can navigate self-doubt, based on your personality type. INFJs experience a lot of self-doubt in their lives, mostly because they are far too hard on themselves. They feel a lot of pressure to do the right thing and to live up to their own expectations in life. This can often cause the INFJ to feel like they aren’t doing well enough, and like they haven’t accomplished any of their larger goals. When they are doubting themselves it is important that find a way to break the cycle and stop going towards the downward spiral that inevitably leads to them feeling even worse about themselves. They can often feed into this self-doubt instead of searching for ways to overcome it. It is best if they find someone who grounds them, since what the INFJ truly needs is some perspective during this time. They can lose sight of how amazing they are, and how much they actually do for others. They might need a close confidant to bring them back to reality and help them overcome what they are going through. ENFJs are caring and giving people who often put on this image of being confident and capable. Their biggest struggle is that ENFJs don’t want anyone to see the cracks in their armor. They want appear perfect so that they don’t let anyone down, and always remain the shoulder to cry on. This can definitely cause the ENFJ to experience self-doubt, especially when they are hoping to be perfect one all of the time. This puts too much pressure and sometimes allows those feelings of self-doubt to creep in. When this occurs the ENFJ needs to take a step back and think about their own needs for a little while. The problem is that they have likely neglected themselves so much, that they are feeling emotionally and even physically drained. Taking some take to think about their own needs and set a few boundaries, can actually help them let go of those negative emotions. INFPs can be rather hard on themselves, creating a lot of pressure to live up to their own morals and expectations in life. They can struggle to really feel proud of themselves, and feel overwhelmed when the self-doubt starts to creep in. When the INFP is doubting themselves they truly need to take a step back and reground themselves. INFPs can have their head in the clouds, and sometimes their imaginations can lead them to overanalyze their own actions too much. What they need is to take some time doing the things they love and can be proud of, and to actually have the guts to share them with someone they love and trust. They often need someone who can ground them and make the INFP feel proud of themselves once again. ENFPs can appear rather confident and bubbly on the outside, but they definitely experience feelings of self-doubt. When they are struggling with these emotions they might try to appear strong and don’t want others to think less of them because of it. When the ENFP is feelings overwhelming self-doubt, they often need someone who believes in them so that they can regain perspective. Doing something that they are good at often helps the ENFP regain confidence, and feel more aware of their own abilities. Having someone who loves the ENFP and truly believes in them, can help them to realize how capable they truly are of succeeding. It can also benefit the ENFP to take some time doing what they enjoy with someone they love, and who they feel safe with. INTJs definitely appear confident most of the time, but that doesn’t mean they don’t experience self-doubt. They work hard to keep themselves constantly aware and completely educated on just about everything, but this is a lot to live up to. If the INTJ fails at even the smallest thing, or feels like they aren’t researching enough on their own, they can start to experience some doubt in their own abilities. When the INTJ is doubting themselves there are a few things they can do to get back on track. They often need to regain some perspective, since the biggest issue for them is being inside of their own inner world a bit too much. Being inside of their own heads can cause the INTJ to compete with themselves in a way that makes them experience doubt. When they can actually expose themselves to others and possibly find someone they can teach and help, it gives the INTJ a more accurate perspective of how capable and intelligent they truly are. ENTJs strive to be confident in themselves and their abilities, but they are still capable of experiencing self-doubt. If the ENTJ fails at something, even the smallest thing, it can create a strong sense of self-doubt in their own abilities and accomplishments. When this occurs what the ENTJ truly needs is to regain some perspective and take a few steps back from the situation. They need to be around people who celebrate their accomplishments, and show them just how much they are capable of achieving. They need to look around them and stop comparing themselves to some idea of perfection that does not exist. Recognizing their strengths and their abilities and realizing that most people aren’t to their level, often helps the ENTJ regain their confidence. INTPs are extremely analytical people, which is a major reason why they experience self-doubt. They often overthink things and this can make it challenging for them to get outside of their own heads. When the INTP gets trapped inside of their analytical process, it can certainly create immense self-doubt. This occurs because they can see all of the possible negative outcomes, and it sometimes causes them to feel a bit stuck in one place. When the INTP gets stuck in this loop they need someone around them who is lighthearted and understanding to help pull them through. They don’t need someone to push them and make them feel more pressure, but rather someone who can lighten the mood and bring them towards a more positive perspective and a realization of what life is truly about. ENTPs definitely try to appear confident and in control most of the time, but that does not mean they are incapable of experiencing feelings of self-doubt. ENTPs definitely struggle with self-doubt, especially since they are such analytical people. Having the ability to intuitively predict many potentially outcomes, is something that makes it challenging for the ENTP to move forward sometimes. Seeing how things can go wrong and how they could be doing better, it definitely a bit crippling at times, When the ENTP is feeling overwhelmed they need to take a step back and pull outside of their inner minds for a bit. They need jump into something new without reservation. ISTJs try hard to remain focused and do what they can to accomplish their goals without allowing self-doubt to creep in. They strive to remain confident in their abilities by constantly improving and working hard. ISTJs do however experiencing self-doubt if they have a moment where they fail at something, even something small. It can cause them to reassess their situation and they will feel overwhelming by this. When the ISTJ does experience self-doubt they need to take a step back and regain some grounded perspective. It can actually be beneficial for the ISTJ to take a vacation or some times to actually relax and focus on themselves. When their downtime is over they can benefit from looking at their accomplishments and recognizing what they have truly been able to do with their abilities. ESTJs don’t like failure, and will definitely experience self-doubt if they make a mistake with something. They work hard to get things done and strive to be as efficient as possible, and most of the time this helps them be confident in their own abilities. When the ESTJ makes a small error it can leave them feeling stressed and overwhelmed, and might make them doubt their own abilities for a while. When this happens they need to be around people who believe in them and can help the gain perspective. Someone who is willing to celebrate their abilities will definitely help the ESTJ come back to realizing who they are and what they can achieve. ISFJs definitely experience self-doubt from time to time, especially since they care so deeply about providing for others. ISFJs work hard to make sure their loved ones are happy and this can put too much pressure on them sometimes. When the ISFJ starts to doubt themselves it can be a bit overwhelming, and they need to be able to take a step back. They need to look at how much they do, and possibly be around someone who loves them and actually appreciates what they do. On top of that the ISFJ needs to take care of their own needs for a while and actually recharge their batteries. ESFJs can definitely feel self-doubt, since they put so much pressure on themselves. ESFJs want to be able to take care of their loved ones and work hard to make sure they are protected. The fact that they spend so much time and energy trying to make others happy, can cause them to doubt themselves. ESFJs are perfectionists sometimes, and they don’t always feel like they are doing good enough. When the ESFJ starts to experience self-doubt what they usually need is to take some time for themselves. They need to remember to set boundaries and start taking care of their own needs before they can actually regain a sense of confidence in their abilities. ISTPs try to remain independent and self-confident, but that doesn’t mean they don’t experience doubt. When the ISTP does start to doubt themselves it can be challenging for them to pull out of this. They can go into a spiral of analyzing their actions and their goals in life. The ISTP often needs to get back to knowing who they are, and dive into something that can help them regain confidence. They are often good at many things, so the ISTP needs to dive into those activities that can help them become who they need to be. ESTPs do experience self-doubt when they feel like they aren’t truly accomplishing their goals. They put a lot of pressure on themselves to please their loved ones and be someone they can actually look up to. When the ESTP is doubting themselves and feeling like they haven’t really achieved enough, they often need to take a step back. They are happiest when they can live in the present instead of obsessing over the future, and that is exactly what the ESTP needs to do. Being around someone who can accompany them and make them feel like themselves again, is often helpful. ISFPs can have rather sensitive and fragile hearts, which can definitely cause self-doubt to sneak in. When they are feeling overwhelmed and doubting themselves, they need to be around people who can bring them up. The ISFP needs to get away from the toxic people or environment that are causing them to doubt themselves. If they can be around someone who believes in them and wants to make them feel loved, it will make a huge difference for the ISFP. ESFPs can definitely experience self-doubt, but this is usually connected to people. When the ESFP is around someone who puts them down or makes them feel bad about themselves, it can weigh heavily on their hearts. ESFPs appear condiment and fun-loving, but they do have sensitive souls that can be hurt easily. When someone they love continues to bring them down, the ESFP will start to truly doubt themselves. They will need to be around someone they love who actually believes in them and brings them up. If that cannot happen then the ESFP needs to be on their own and they need to regain their independence away from those toxic people.